While I am not primarily a digital scrapbooker myself, I have dabbled in it (and, of course, collected a mass of digital freebies over the years). So, when I was asked to review Digital Scrapbook Artist, I thought I might be able to offer an interesting perspective - especially for someone who was considering getting started with digital. Serif Digital Scrapbook Artist is just what you've been waiting for - a way to combine your creativity with your passion for celebrating and treasuring life's special moments. At last, novices and accomplished scrapbookers can easily create outstanding photorealistic results that look every bit as lifelike as traditional handcrafted scrapbooks. It certainly sounds great and quickly discovered that the claims were well-founded once I started playing within the program a bit. Within minutes, I created the following layout with one of the pre-designed templates provided within the software. The software comes with a huge collection of digital papers, embellishments and more, so you can get started instantly creating your personally designed layouts from scratch with ease. However, what I really liked about the program was that it also allows you to upload any digital elements that you might already have on your computer. That way you can stay completely true to your own personal style while creating your digital pages. I found the software extremely easy to navigate and was surprised by the level of customization available - you can change the color, size, orientation and more on basically ANY element on your page! Moving elements about your page requires a simple click and drag. You can also give your layouts a realistic texture with the wonderful drop shadow effects. Also included with the software is a free membership at daisytrail.com which is a wonderful way to share your layouts with friends and family (with ONE CLICK) as well as share ideas and tips with other DSA users. You can also export your layouts into other formats (such as jpeg) if you like to share your layouts in other online galleries or on your blog. If you are considering getting into digital scrapbooking, I would definitely recommend this program. 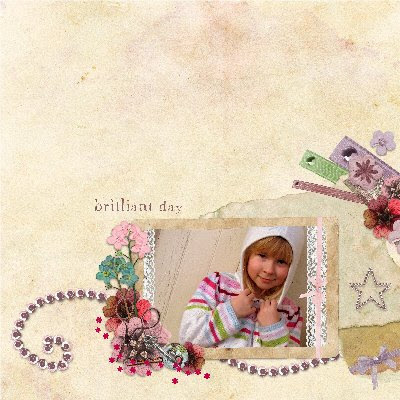 For more information about Digital Scrapbook Artist, you can visit their website here.